The airport is located 18 kilometers (11 miles) to the North-East from the Sharm El Sheikh resort-city at the highway (the El-Salam street) leading through the airport along the recreation area of Sharm El Sheikh. The airport buildings are perfectly noticeable from the highway and it's impossible to miss them. The two passenger terminals are situated one behind another. Taxi ranks are located next to the passenger Terminal 1. Taxi offers 24-hour services. The car can take you to the Sharm El Sheikh hotels, the residential neighborhood of the town and to the neighboring resorts. It's possible to order a taxi to the airport just for the arrival time. Taxi order number is 122 with any mobile carrier. It's better to settle with the taxi-driver the price for transfer beforehand in order not to be cheated. As a rule luggage is included into the transfer price. Regular transportation in Sharm El Sheikh is carried out by private carriers offering the passengers only minibuses. 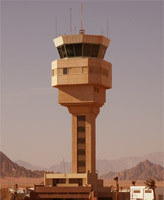 The bus stops are located next to the Sharm El Sheikh airport passenger Terminal 1. The Sharm El Sheikh public transport is peculiar of the absence of fixed stops on the route, pick-up and drop-off is made on demand. The buses start from the airport filled up. It's better to settle with the bus-driver the price for transfer before the departure in order not to be cheated. It takes about 15 minute drive to the center of the Sharm El Sheikh city.